Fire retardant varnishes for wood and timber, are clear protective coatings which protect and beautify the natural appearance of the surface. Now available in wood stain colours as well, they are ideal for fireproofing any size area of exposed wood beams, boards, MDF, veneer, etc. Click here if you require coloured fire-retardant paints for wood and timber. Fire retardant varnishes can offer BS Class 1, Class 0, EN Class B and 30 or 60-minute protection depending on the requirement, circumstance and system choice. 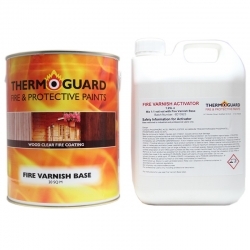 Most fire-retardant varnishes are part of a system which includes a basecoat and topcoat to complete the protection. These clear or wood stain coloured translucent fireproof varnishes provide a fire protection layer allowing the ornate and decorative elements of wood to be kept as is, without having to use opaque, coloured coatings. Popular areas that require the fire protection provided by retardant varnishes, include interior and exterior cladding, ceilings, beams, hoarding, panelling and more. 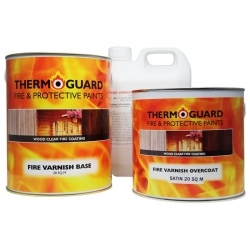 When exposed to fire, Thermoguard Fire Varnish expands to create an insulating barrier, protecting timber surfaces from flames, heat and oxygen and suppressing emission of deadly smoke & gasses. 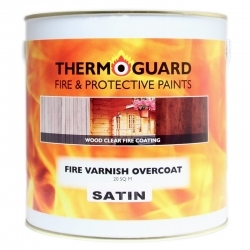 If you are unsure about which fire-resistant varnish to use, please contact us immediately for advice. Whether indoor or outdoor, considering fire protection measures are equally important. So, whilst using a product internally may stop the spread of flames to escape routes, if flames are exposed to external wooden panelling, they can pass and move around a building very quickly and destabilise or block fire escapes. Treating external wooden panelling or cladding, can mean that a fire which spreads to, or starts at one property, offers additional smoke suppression and flame spread protection to other areas of the property and others nearby. As an additional note, general maintenance around external fire protective coating usage is a priority. Rawlins Paints sell a range of safety and security products, and it needs to be kept in mind that sources of arson or accidental fire can come from bins, storage facilities connected to a property, unkept foliage, and highly flammable materials left exposed to the sun or a heat source. Many of the fire-retardant varnishes available to buy today at Rawlins Paints, like Bollom Intulac Ultra, offer excellent adhesion to previously varnished surfaces – if they are sound, in good condition and receive adequate preparation. Please contact our technical support team if you are in doubt about a product’s coverage capacity to previously treated wood and timber surfaces. Each product listed in this category comes with a datasheet, which will offer advice on surface preparation, application, drying times etc. and should be read and understood before use. Exposed timber beams and structural framework in loft conversions, attic spaces, hotels, private properties – flats, houses, bungalows – windmills, school out-buildings, etc. Shopping centre kiosks, garden centre display structures and retail stands, night-club décor, theatre stages (including props), bars and food/drink service points, pop-up stalls on food fairs, fairgrounds, markets, etc. It is important when purchasing fire retardant varnishes to ensure that you are choosing the correct product which meets the requirements of your authority. Most manufacturers will issue a Certificate of Supply upon request for each correctly specified project for Insurance, Fire and Building Control Authority and Client Records against proof of purchase.